Please share your review of the Life on State Plan recommendations. The plan is the first step toward changing zoning, funding and building improvements, and working toward better mobility. Your responses help us understand if the plan meets your expectations and how we can best fulfill the vision for Life on State moving forward. This questionnaire has ten questions and should take about 10 minutes to complete. You will review drawings, maps and results and then respond. It may be helpful to read the Plan or Executive Summary online first for better page formatting, and to explore the ideas more. Making the street safer for walkers, bikers and cars. Adding more trees, trails and open space. Adding housing to the neighborhood. 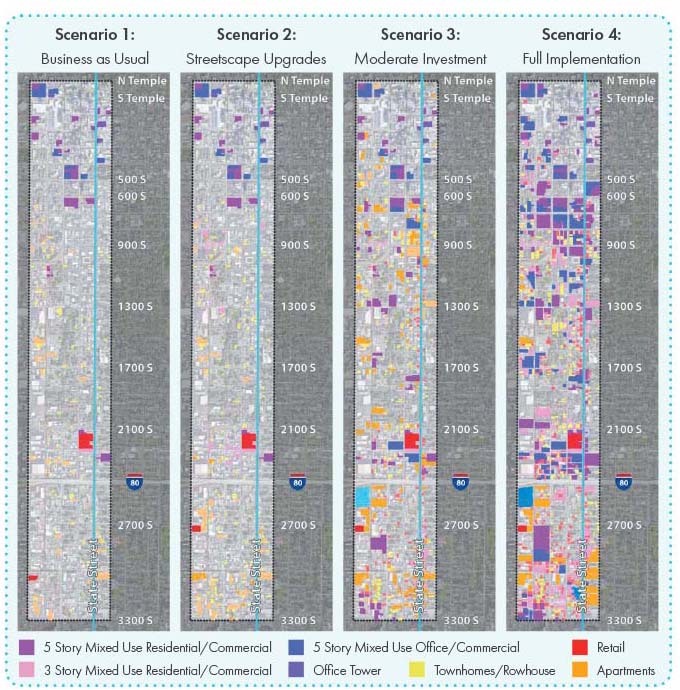 The Land Use Scenarios and Street Design Options show a range of future changes possible. The four options reflect likely development and shifts in character with each degree of change and investment. Click here if you wish to open the scenario/graphics graphics in a new window. Please rate how you think each scenario/concept achieves the goals of Life on State. - No change to roadway conditions. - City zoning and development regulations remain unchanged, favoring lower densities and commercial buildings. - Minimal growth and development outside of SLC and SSL downtown. How well do you think CONCEPT 2 achieves the goals of Life on State? - New landscaped medians and street trees. - New city regulations that favor compact, urban development, including housing and mixed-use. - High-density development concentrated in downtown area. - Little to attract developers of high-density, high-investment projects. How well do you think CONCEPT 3 achieves the goals of Lifeon State? - Increased appeal to developers of high-density, high-investment commercial projects. * 5. How well do you think CONCEPT 4 (either variation)achieves the goals of Life on State? - A curbside priority lanes for parking and transit, possibly separated from through traffic by a landscaped median. - Appeal to developers of high-density, high-investment mixed use and housing projects. * 6. 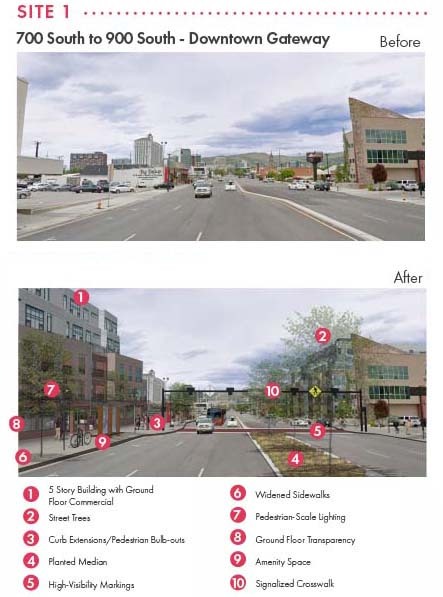 The Catalytic Sites show how different design strategies could improve the street and neighborhood. These are locations where redevelopment is likely and changes could make the greatest immediate impact. Click here to open a new window to see the site plans and visualizations together. Please rate how you think each Catalytic Site achieves the Life on State goals. * 7. How well does Site 2 achieve the Life on State goals? * 8. How well does Site 3 achieve the Life on State goals? The Life on State team used a computer model called Envision Tomorrow to analyze how well each scenario performed on a few key goals. Some goals were more qualitative and were not measured with numbers. Reviewing these measures of success, do you agree that the scenarios performed as you expected? * 10. Which one of the four scenarios do you hope to see implemented? Why did you choose the scenario you did?